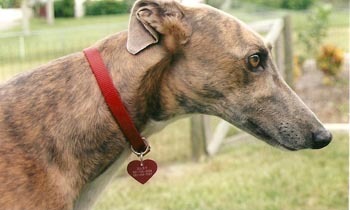 Mary, aka Mustang Maryann, was our first Greyhound. We adopted her on July 8, 2005. 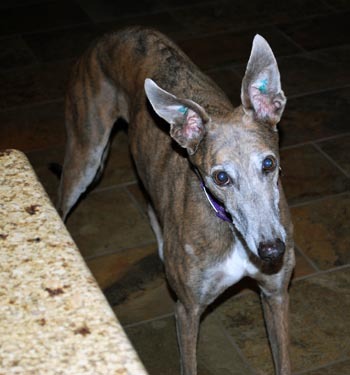 Mary was an Irish born Blue Brindle with a powerful neck and large chest. She was very shy with people, but never met a dog that she didn't like. Her need for a companion dog prompted us to adopted another greyhound, and so our adventure began. Mary was the matriarch of a "four greyhound pack" plus one. Two females, two males, and a tabby cat. As Mary's shyness declined, her personality emerged. She would tilt her head to the side and wag her tail to demonstrate her excited side, a quick bust of speed in the back yard showed us her impulsive side, and her "air snapping" and barking as we prepared her meals showed us her impatience. Mary's most interesting quality was her ability to communicate with her eyes. She had large lightbrown eyes and should would stare intently at us when she wanted or needed something. We called her stare the "Greyhound Mind Meld". When she was diagnosed with osteoscarcoma, when made a pledge to not allow her quality of life to suffer. At the appropriate time, our family veterinarian helped us usher her peacefully to Rainbow Bridge.